As if art admirers needed another reason to see ‘The Adoration of the Mystic Lamb’ following restoration, a remarkable discovery has been made concerning the title character itself. Restorers working on the famous Van Eyck altarpiece in Ghent have finally completed the removal of the overpaint on the part of the central panel that features the sacrificial lamb. 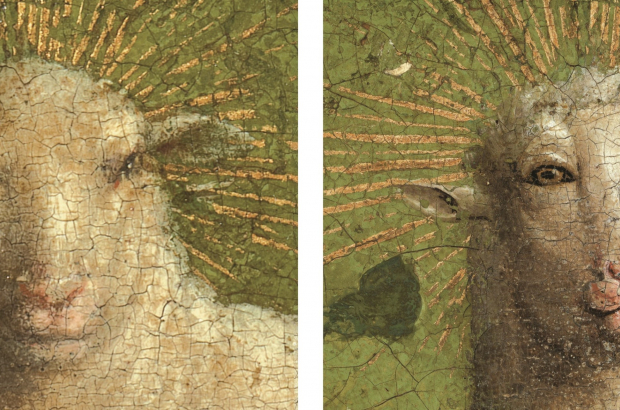 The lamb we’ve been seeing for some five centuries was the product of overpaint by other artists. Remarkably, Jan and Hubert Van Eyck’s original lamb looks entirely different from the version added later. Much of the 15th-century altarpiece, made up of 20 panels, was overpainted in the 16th century in an effort to cover up minor damages and earlier poor attempts at restoration. The lamb was then rendered into “an impassive and rather neutral figure,” restorers said in a statement. The original, by contrast, sports “an intense gaze and is characterized by a graphically defined snout and large, frontal eyes, drawing onlookers into the ultimate sacrifice scene”. The Van Eycks, it seems, gave the lamb much more of a personality – which has been lost for most of the life of the painting. A mid-20th-century partial restoration revealed the lamb’s original ears, but techniques were not advanced enough to restore the rest of the lamb without causing damage. So since 1951, the lamb has had four ears. The Ghent Altarpiece is one of the world’s earliest oil paintings and is considered one of European art’s greatest masterpieces, but overpaintings over the centuries – the latest was carried out in the 19th century – have hidden much of the original work. The restoration of the 20 panels, financed in part by the government of Flanders, began in 2012, when the team discovered that some 40% of the piece had been overpainted. The restored panels on the outside of the piece – which was created as a cabinet that opens and closes – were unveiled in 2016 to international acclaim. The altarpiece is on view to visitors in Ghent’s Sint-Baafs Cathedral. Between noon and 13.00 every day, the altarpiece is closed, when the restored panels on the outer doors can best be seen. At other times, the altarpiece is open, revealing the 12 inner panels. Four of the inner panels – including the central lamb panel – are currently under restoration and are replaced by copies. The restoration is taking place at the city’s Fine Arts Museum, where visitors can watch the restorers at work.